LAFARGEVILLE, NY – Matt Sheppard has had a hot start to the the season. A win at Volusia, $12,000 banked at Orange County last week, $7,500 the night before at Grandview, and $10,000 tonight at Can-Am Speedway. Needless to say, Sheppard will not need to eat off the dollar menu much in the near future. Ever since the event was scheduled, talk around the internet has been about the weather and track conditions. While race day highs were near 60, heavy rains the night before meant the infield and pits were flooded. Tyler Bartlett and his Can-Am crew worked hard to get a good surface, and ultimately the track remained racy for all 100 laps. While the end product was good, what did Sheppard anticipate coming into the event? Sheppard led just shy of 90 laps on the evening, and saw a number of his top competitors fall by the wayside. How does a driver manage a race when they know they are the dominant car, but also know the surface can bite them at any time? Jimmy Phelps held the lead through a rough start to the Super DIRTcar Series season, which saw Larry Wight break a front end on lap one, and eighth starter Dave Rauscher slowed to a stop on lap two. Lance Willix broke a rear end right before the field went back green, which allowed Wight to fix his collapsed front end and return to the race just a lap down. Phelps did not fire well on the lap nine restart, and Sheppard went to the lead. Behind Sheppard, Erick Rudolph made his way to second and began pressuring Sheppard. With Sheppard high and Rudolph low, Rudolph nosed out in front to lead lap 22. However, Sheppard took it right back the next lap before Danny Johnson slowed for a yellow, driving a blank, duct-tape number one Troyer. Rudolph snatched the lead back on the lap 28 restart, but Sheppard repeated his earlier move to retake the lead. Can-Am’s surface was very good for the weather, but there was a moderate sized hole exiting turn four, and Rudolph caught it hard. This knocked him back to fourth, allowing Billy Decker and Billy Dunn to get by. All eyes were then focused on Wight, who ripped the top back to the top 10 after going off on the hook earlier. By lap 35, Sheppard’s lead was the better part of a straightaway, but a lap 41 yellow let Decker and company catch back up. Decker and company were not caught up for long, as Sheppard was long gone off the restart. Decker was left to fend off Rudolph, but in the meantime Sheppard pulled his lead up to three quarters of a straightaway. Just as Sheppard caught traffic, Ryan Godown slowed from eighth on lap 66 with a flat. The lap 70 restart saw both Decker and Sheppard bobble, and Dunn drove to second. Another quick yellow meant Sheppard had a new primary challenger on this restart, but held him off for the moment. On lap 76, Decker’s third place run came to a halt sideways in the turn four infield. Mat Williamson went to third on the restart, and Dunn went on the attack. High and low Dunn looked, but couldn’t get the pass done on Sheppard. Ryan Arbuthnot lost a wheel two laps after the restart, turning the yellow lights on once more. Giving speed grades with 20 to go, Dunn, Williamson, and Rudolph were all tied at an A. However, Sheppard was consistently a tick better at an A+, and none of the aforementioned three drivers could quite keep pace. Another yellow on lap 86 erased Sheppard’s two second lead, allowing Dunn another shot. On the restart, Phelps had the front end give up on him, ending his night from sixth. Sheppard continued to motor away, but the battle for second was heating up. On lap 93, Williamson found a hole under Dunn and grabbed second; and was greeted by a caution flag soon after. The pass counted as official, and Sheppard once more had a new dancing partner at the front. Rudolph’s fourth place run ended with five to go, but all eyes were glued to the top three. Williamson wasn’t letting Sheppard get away, and Dunn wasn’t letting either of them get too far out. 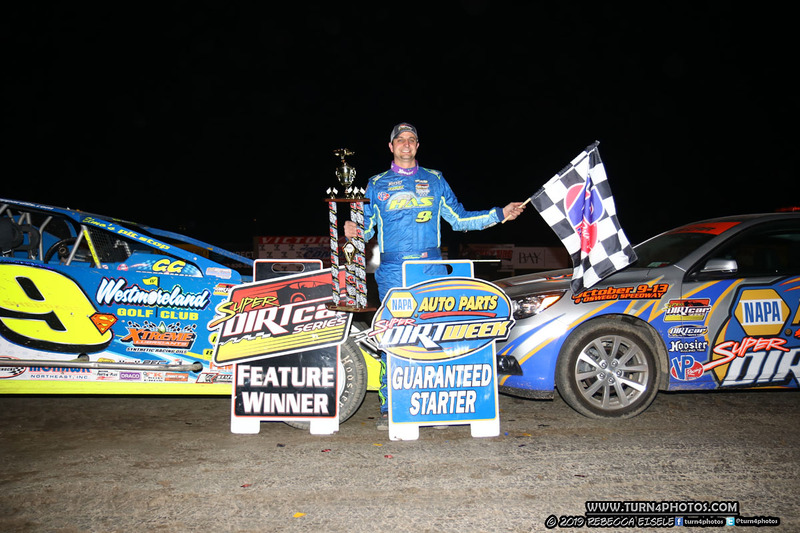 Try as they might, nobody was catching the 9s, as Matt Sheppard rolled to the Thunder In The Thousand Islands 100 victory in dominating fashion. Williamson and Billy Dunn joined him on the podium, while Justin Haers and Pat Ward notched Bicknell a clean sweep of the top five.